Anyone can tell you that winged liner is the number one staple in a pinup girl’s arsenal, and it can be tricky to get right. 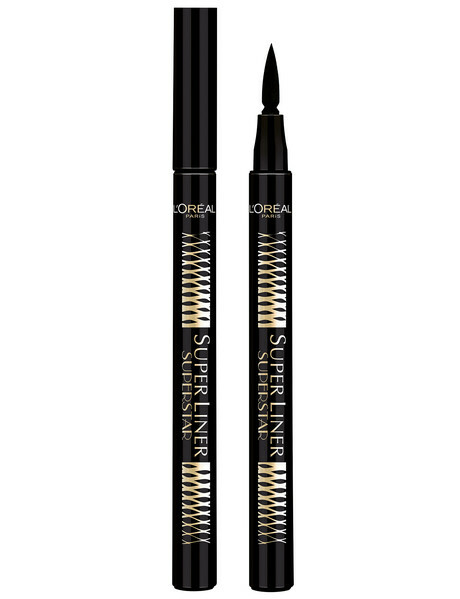 It helps to have the right tools though, and lately I’ve been trying out two products from the L’Oréal ‘Superliner range – the ‘Superstar’ felt tip liner and the ‘Gel Intenza’ gel pot liner – and they’re both fantastic! From super thin to super bold in a single stroke! 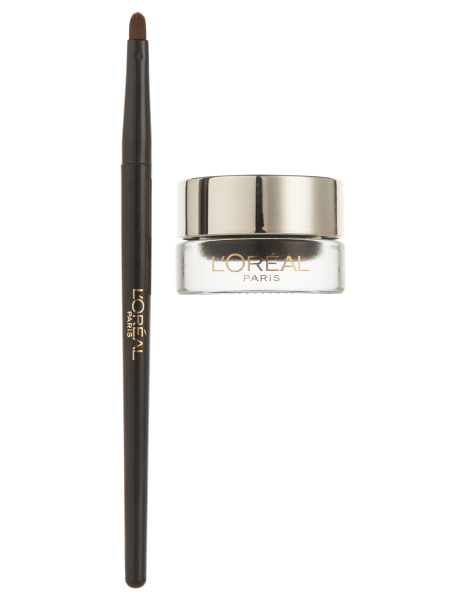 I love a felt-tip liner for doing basic makeup when I’m in a hurry (or if I’m on the bus!) because they’re super easy, nice and precise, and they don’t dry and crack like liquid liners can. This one in particular is great because it a firm but flexible ‘teardrop’ shaped tip, so there’s a bit more maneuverability and you can easily create a thick line with a finer flick at the end without too much fuss. While I love felt liners, gel liners are my absolute favourite! You can get so much precision, create bigger bolder lines, and it’s much more buildable than liquid or felt, which will often just start to pull itself off if you try and go over your lines too many times. The other main advantage is the fact you apply it with a brush – this one comes with a nice slightly thick angle brush, but I have a whole bunch of other brushes that I can also use, depending on the sort of line I want – and this means that you have more control. The L’Oréal Gel Intenza has a thick, solid colour and a really creamy consistency, which is perfect for creating bold dramatic wings. 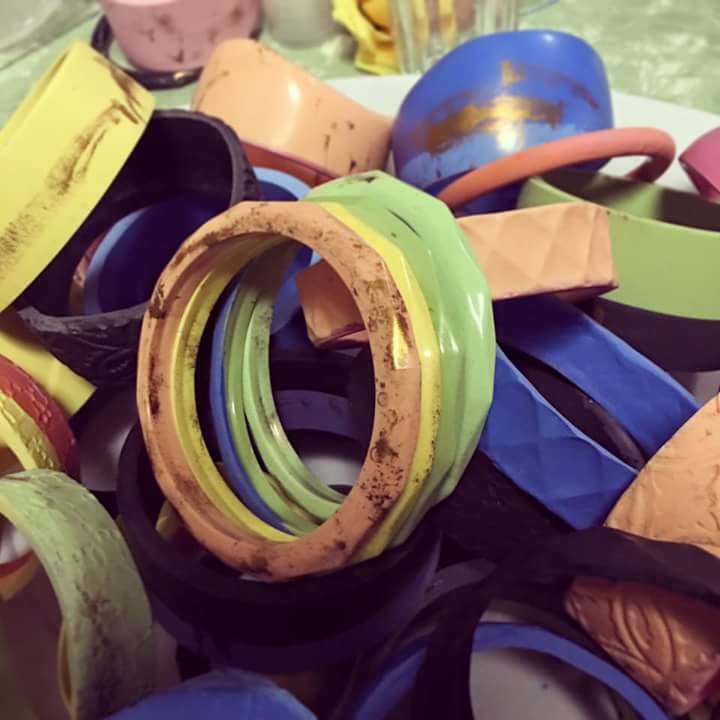 Accessories – Plus Sized Bangles from Ample Armoury! 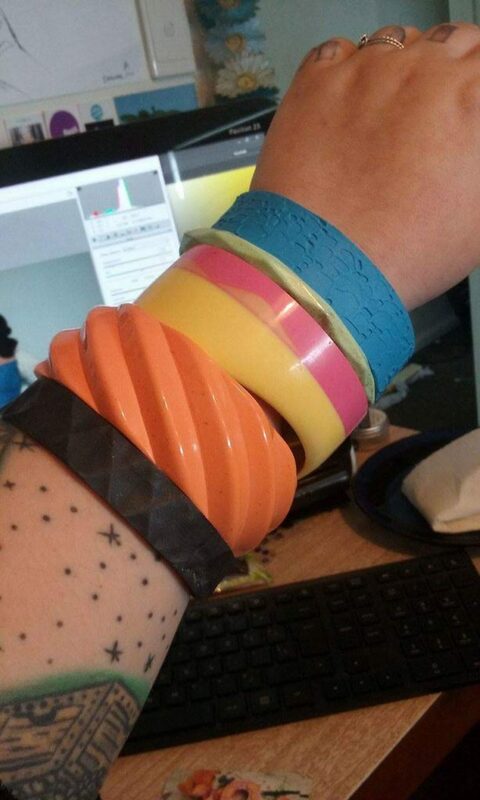 I’m not sure if you guys have noticed, but I have a lot of bangles. A whole lot. And I’d have even more if it was easier to get them big enough to fit over my big ol’ hands. Thankfully, I recently discovered Ample Armoury on Instagram, and immediately messaged Sascha (the talented lass behind the label) to ask about when and where I could buy allllllllll the bangles! She’s super busy with preparations for the A-Plus Market for MFW+ on the 28th of August, but as soon as she’s officially launched there, you’ll be able to buy her gorgeous bangles for yourselves! With a bit of enthusiastic sweet-talking, I managed to get a few of them before the official launch (I imagine she agreed so I’d leave her alone!) and they are fantastic! Each bangle is hand cast in resin, and they come in a whole range of colours, textures, and finishes, with sizes varying from 7.5 – 9cm in diameter. My favourites are the peachy one and the skinny mint green with gold flecks, but I also absolutely love the black and blue matte finish ones that have a more rustic carved pattern, and you all know yellow and pink are my colours…Who am I kidding, I love all of them and I can’t wait until Sascha opens an Etsy shop so I can buy more! Fashion – MCM Furniture Skirt from Kabella Baby! Ok, so, honestly, I have loved this print since the moment I first saw it, and it’s even more gorgeous and quirky in person! The colours are phenomenal – I went for breakfast with Kaye from Kabella Baby on Thursday morning and I just couldn’t stop staring at her – The vivid orange and teal with her hair was just so amazing, so when we went to the shop and I saw them all hanging there on the rack I knew I had to try one on….which of course means there’s a little tissue-wrapped parcel in my suitcase waiting to be snuck past my husband when I get back to Auckland next week! How cute are we, all matching in our new skirts?! The fabric wasn’t at all what I expected, but it means it’ll wash really well without fading (which can be a huge problem with bold prints on cottons) and will be super easy to iron / steam any creases out…and anything to minimise time spent ironing is gold for me! 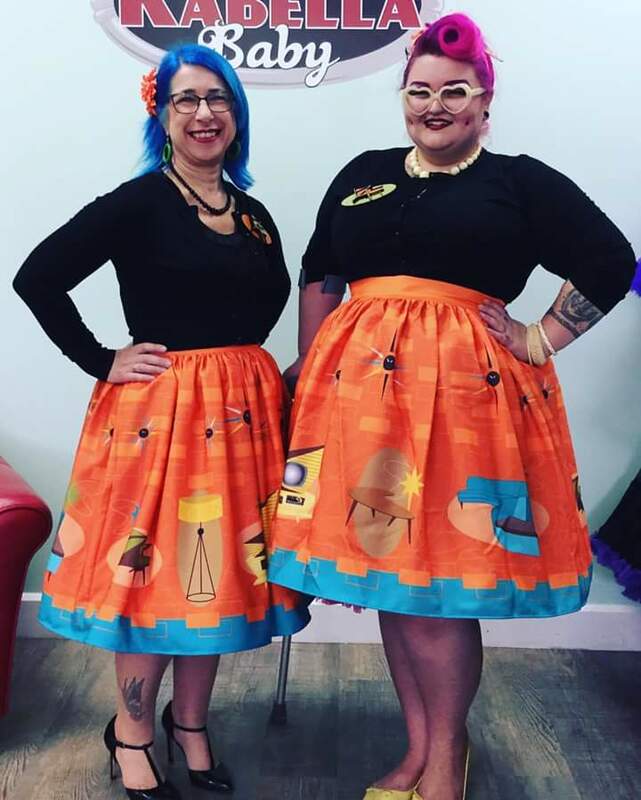 Kaye also has the Pineapple Smoothie skirt and the Tiki Drink Menu skirt in sizes S – 3XL, and the Wood MCM Chair brooch (which perfectly matches the MCM Furniture skirt!) with a few more designs winging their way to her shop right now! 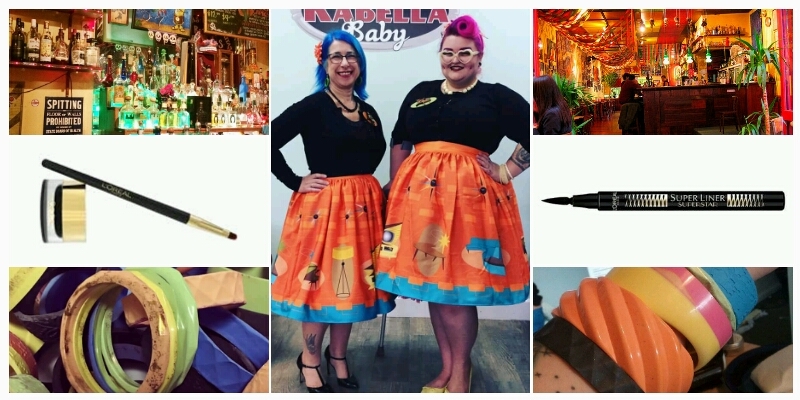 Kabella Baby are currently the only NZ stockists of Oblong Box Shop skirts, and the MCM Furniture skirt in particular is on sale for an introductory price of $170 – down from its regular price of $185 – so get in there and snap them up before they disappear! 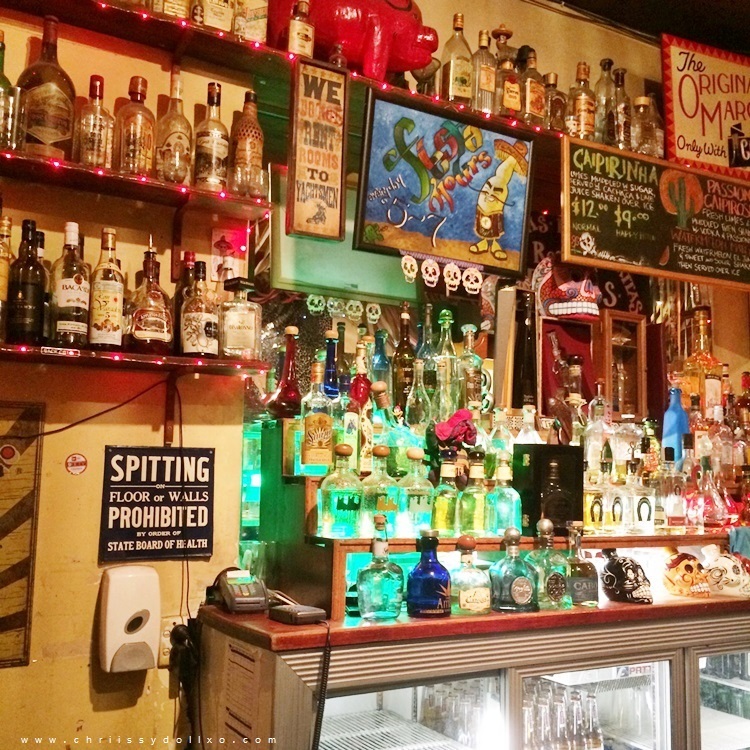 Bonus Extras – Dinners at the Mexican Cafe! 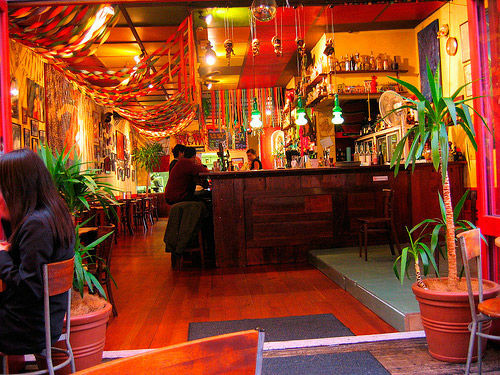 The Mexican Cafe on Victoria Street is an Auckland institution, which I love dearly! It’s my number-one favourite place to take visiting guests, or to do cheap-and-cheerful meals with groups of friends. But don’t just take my word for it – There are over 40 meals on the menu, and they have a well stocked bar (over 80 different Tequilas, 18 beers (including Mexican beers), 35 wines, and a very exciting house cocktail list) and offer non-alcoholic fruit smoothies and complimentary soft drinks for designated drivers – so it’s well worth booking a table and heading along to try it out for yourself!